The museum recently re-opened in the Palazzo dei Canonici della Cattedrale. Most of the exhibits are in the rooms of the original Palazzo dei Canonici della Cattedrale, under the later palace. The museum also includes the crypt of San Rufino. Opening hours etc are published on the website of Musei Ecclesiastici Umbri, and the museum itself has a very good website. The so-called Roman corridor houses a series of Roman remains that have been found in or near Piazza San Rufino. This damaged relief (at the end of the left wall in the illustration above) depicts two women holding the central disc that originally contained an inscription, a group of three men on each side enacting a sacrifice. The crypt of of the earlier church of San Rufino is now accessed from the museum. The following works, which have been removed from San Rufino, are also now exhibited in the museum. These carved capitals were found in the crypt of Bishop Ugone’s church at the end of the 19th century and probably came from this church. The inscription on this small container reads “OSSA S RUFINI EPI ET [M]ART” (bones of St Rufinus, bishop and martyr). It presumably held the relics of St Rufinus from the time of their translation to Assisi until the 11th century, when they were reunited with the original sarcophagus following a series of miraculous evens that prompted Bishop Ugone to build his church. It was in the crypt of Bishop Ugone’s church until its recent transfer to the museum: the original sarcophagus remains in the crypt. 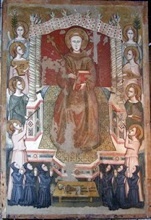 These frescoes, which are attributed to the Maestro di Santa Chiara, were painted on the walls of the left apsidal chapel of San Rufino soon after its construction. The chapel was walled up as part of the restructuring of San Rufino in the 16th century, and the frescoes were then forgotten until 1894, when work began on the construction of the Cappella della Madonna del Pianto. They were detached from the walls at that time. ✴a right hand raised in blessing. Giovanna, the widow of Francesco Acceptanti, left money in her will for this polyptych for San Rufino in 1462. The inscription on the base of the throne contains the signature of Nicolò di Liberatore, l' Alunno and a date (MCCCCL ...). Giorgio Vasari saw the altarpiece on the high altar of San Rufino in 1563, but it was removed during the remodelling of the choir, which began in 1575. It was first recorded on the Altare della Immacolata Concezione (the 3rd on the left) in 1581 and it remained there until 1864. ✴St John the Evangelist and a deacon on the right. ✴figures of the Annunciation (to the sides). ✴the translation of the relics to Assisi. In this last panel, an ox-drawn cart carries the uncorrupted body of the saint, with the earliest surviving cityscape of Assisi in the background. The central predella panel, which was probably removed when a tabernacle was placed on the altar in 1582, was subsequently lost. The inscription that replaced it records that its surviving components were reassembled and restored in 1874. These doors from the choir by Giovanni di Piergiacomo da San Severino depict St Rufinus and another saint, perhaps St Cesidius. ✴The Confraternita di San Lorenzo probably commissioned the panel of St Lawrence and Flagellants, which belonged to the altarpiece of the Crucifixion on their altar in the right aisle. ✴The Confraternita di San Gregorio probably commissioned the panel of St Gregory the Great and Flagellants, which belonged to the altarpiece of the Deposition on their altar at the head of the left aisle. These votive frescoes were detached from the room above the present Cappella della Madonna del Pianto in 1936. These panels are probably associated with the above payment made to “maestro Rafaello” (almost certainly Raffaellino del Colle) in 1556. They are on what seem to have been hinged doors that probably belonged to a structure in the baptistery of San Rufino. The Confraternita di San Vitale commissioned this altarpiece for the Altare di San Vitale in the presbytery, where it was first documented in 1613. It depicts a miracle of St Vitalis, in which he restored the speech of a young man who was dumb. Successive bishops of Assisi objected to this subject (probably because there was no foundation for the miracle), but attempts to remove the altarpiece in 1632 and 1659 came to nothing. 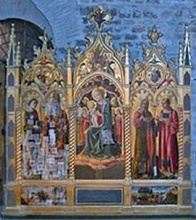 Bishop Tegrimo Tegrimi built the Altare di San Francesco in the presbytery and subsequently commissioned this altarpiece for it from Cesare Sermei. It was removed in 1848 when this altar was demolished. It depicts St Francis receiving the baby Jesus from the lap of the Madonna. In 1637 ,Canon Girolamo Evangelisti rebuilt the Altare di San Rufinuccio in the presbytery and rededicated it to SS Rufinus d’ Arce and Jerome (his name saint). He also commissioned this altarpiece, which is attributed to Cesare Sermei. It was removed in 1848 when this altar was demolished. It depicts St Rufinus in front of the well into which he was thrown, holding a scroll inscribed with the word “veritas” (an allusion to the fact that the testimony that had provoked his martyrdom was actually true. The penitent St Jerome kneels on the rim of the well, with his lion below. •the kneeling St Rufinus d’ Arce holding a scroll proclaiming the truth of the testimony that led to his martyrdom. This panel, which is attributed to Giacomo Giorgetti, came from the Altare di Sant Antonio di Padova (1664) in San Rufino, which Giorgetti had probably designed. The altarpiece was removed when the altar was re-dedicated to St Emidius in 1751. It depicts a vision of St Antony of Padua in which the Madonna handed the Christ Child to him. 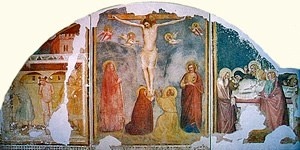 These frescoes, which are attributed to Puccio Capanna, were detached from a lunette in the Oratorio della Confraternita di San Rufinuccio in 1955. ✴The central fresco depicts the Crucifixion with the Virgin and St John the Evangelist to the sides and SS Mary Magdalene and Francis at the foot of the Cross. ✴The better preserved depicts the Madonna and Child flanked by two angels, each of which commends a donor. ✴The other, which depicts the head of Christ and that of an angel, was probably part of a representation of the agony of Christ in the Garden of Gethsemane. This double-sided processional banner from the Oratorio della Confraternita di San Francesco [which is dated by inscription?] is the oldest of its kind preserved in Umbria. It is the autograph work of the unknown Maestro del Gonfalone di San Leonardo (so-called because the confraternity met in the now-demolished church of San Leonardo, near Porta San Giacomo, at the time that they commissioned the banner). ✴The main side depicts St Francis enthroned with angels and members of the confraternity. •the stigmatisation of St Francis (below). St Leonard witnesses the stigmatisation and holds the chains that signify his role as the patron saint of prisoners. The Confraternita del SS Rosario commissioned this altarpiece, which is dated by inscription, for their altar in Santa Maria delle Rose. It is attributed to Lorenzo Doni (the son of Dono Doni). ✴The scene in the lunette depicts God the Father and angels. ✴The main scene depicts the Madonna and Child enthroned: the Madonna gives a rosary to St Clare which the naked baby Jesus gives another to St Dominic. ✴The small scenes depict episodes from the lives of Christ and the Virgin. ✴One side depicts the martyrdom of St Catherine of Alexandria. ✴The other side depicts SS James and Antony Abbot. The Pisan artist Orazio Riminaldi was said to have painted a standard depicting SS James and Philip (sic) in an account of his work written in 1787. This standard was believed to have been lost until 1978, when it was suggested that this was the work in question. The attribution is sustained on stylistic grounds and also by a documented association of the artist and Bishop Marcello Crecenzi of Assisi in 1628. Payments are recorded for this standard in 1626-7 to the otherwise unknown Giovanni Battista Muzico. He was presumably the agent of Orazio Riminaldi, which suggests that the banner was painted in Rome. This double-sided processional banner from the Oratorio di San Lorenzo may be the work that Giovanni Andrea Carlone, il Genovese mentioned in a letter to Bishop Ludovico Giustiniani in 1673. ✴One side depicts St Laurence working a miracle. ✴The other side depicts the martyrdom of St Laurence. A triptych, which is attributed to Matteo da Gualdo, came from the church of Santa Maria delle Grazie in the Castello di Palazzo (outside Assisi). It depicts the Madonna and Child with musical angels and SS Francis and Sebastian. This panel of the standing saint was documented in 1717 on the high altar of the church, with an attribution to Cesare Sermei. The document also attributed five frescoes in the presbytery, which depicted SS John the Baptist, John the Evangelist and the Cardinal Virtues, to Cesare Sermei but these were destroyed in the earthquake. The inscription (which gives the date erroneously as 1512) records that Monaldo Vigilanti commissioned this panel in order to solicit the intercession of St Charles Borromeo for his blind nephew, Francesco. The boy is shown kneeling in prayer at the bottom left. The panel was documented in the 18th century on the Altare delle Reliquie, which belonged to the Confraternita di San Carlo Borromeo. The artist is unknown. This panel was documented in the 18th century on the Altare delle Reliquie, below the panel described above. It was presumably commissioned by the Petriccioli family, whose arms appear on the painted altar frontal: Bernardino Petriccioli, who died in 1635, left money in his will to support a chaplain for this altar, and his heirs may well have commissioned the panel. 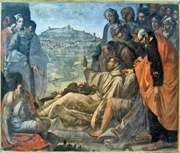 It depicts St Francis opening a bible at random in San Nicolò in order to discern how God would advise Brother Bernard of Quintavalle, who was troubled by what to do with his possessions. He alighted upon three texts in succession, including the following: “If you would be perfect, go and sell what you have and give to the poor, and you shall have treasure in heaven’ (Matthew 19:21). A document of 1806 records that Bishop Tegrimo Tegrimi (1630-41) commissioned Cesare Sermei to paint frescoes of scenes from the life of St Francis for the Sala Maggiore (main hall) of Palazzo Vescovile. Unfortunately, they were destroyed when the palace was restored after the earthquake of 1832. This panel, which was moved from Palazzo Vescovile to San Rufino in ca. 1685 presumably formed part of the same project: original designs for it by Cesare Sermei survive, and a lost inscription bore the date 1640. The panel depicts St Francis blessing Assisi as he is being taken from Palazzo Vescovile to the Portiuncula, which was where he wanted to die. The figure standing on the right is probably a portrait of Bishop Tegrimi. This panel by Giacomo Giorgetti was documented in Oratorio di San Crispino in 1875. It was subsequently moved to Palazzo Vescovile before entering the museum. ✴the other panel (1781), which is signed by Baldassarre Orsini and dated by inscription, was documented on the high altar in 1844 and removed in 1896. The two panels are of very similar dimensions: it has been suggested that the Oratorian Fathers commissioned the panel by Knoller for the high altar, but subsequently moved it to another altar to make way for the panel by Orsini. ✴the later one also depicts St Philip Neri in the way that he had been depicted in a venerated image by Guido Reni in their mother church in Rome (which is is now replaced there by this copy in mosaic). These works come from the works that Frederick Mason Perkins left to the diocese when he died in 1955. This American art critic collector and dealer had lived in Assisifor much of his life. He left the larger part of his collection to the Sacro Convento and most of these works are now exhibited in the Museo del Tesoro di San Francesco. *These works were not exhibited at the time of my last visit to the museum (April 2011). Return to Museums of Assisi.